For "producer" as used in reference to hip hop music, see Hip hop production. The producer typically supervises the entire process from preproduction, through to the sound recording and mixing stages, and, in some cases, all the way to the audio mastering stage. The producer may perform these roles themself, or help select the engineer, and provide suggestions to the engineer. The producer may also pay session musicians and engineers and ensure that the entire project is completed within the record label's budget. A record producer or music producer has a very broad role in overseeing and managing the recording and production of a band or performer's music. A producer has many roles that may include, but are not limited to, gathering ideas for the project, composing the music for the project, selecting songs or session musicians, proposing changes to the song arrangements, coaching the artist and musicians in the studio, controlling the recording sessions, and supervising the entire process through audio mixing (recorded music) and, in some cases, to the audio mastering stage. Producers also often take on a wider entrepreneurial role, with responsibility for the budget, schedules, contracts, and negotiations. In the 2010s, the recording industry has two kinds of producers with different roles: executive producer and music producer. Executive producers oversee project finances while music producers oversee the creative process of recording songs or albums. A record producer who produces a song for another producer without receiving recognition is a ghost producer. In most cases the music producer is also a competent arranger, composer, musician or songwriter who can bring fresh ideas to a project. 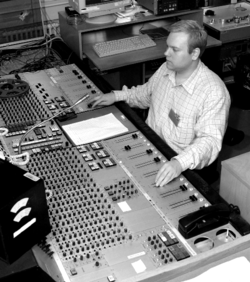 As well as making any songwriting and arrangement adjustments, the producer often selects or gives suggestions to the mixing engineer, who takes the raw recorded tracks and edits and modifies them with hardware and software tools and creates a stereo or surround sound "mix" of all the individual voices sounds and instruments, which is in turn given further adjustment by a mastering engineer. The producer will also liaise with the recording engineer who concentrates on the technical aspects of recording, whereas the executive producer keeps an eye on the overall project's marketability. The role of producers changed progressively over the 1950s and 1960s due to technological developments. The development of multitrack recording caused a major change in the recording process. Before multitracking, all the elements of a song (lead vocals, backup vocals, rhythm section instrument accompaniment, solos and orchestral parts) had to be performed simultaneously. All of these singers and musicians had to be assembled in a large studio and the performance had to be recorded. With multitrack recording, the "bed tracks" (rhythm section accompaniment parts such as the bassline, drums, and rhythm guitar could be recorded first, and then the vocals and solos could be added later, using as many "takes" (or attempts) as it took. As well, for a song that used 20 instruments, it was no longer necessary to get all the players in the studio at the same time. A pop band could record their backing tracks one week, and then a horn section could be brought in a week later to add horn shots and punches, and then a string section could be brought in a week after that. While this facilitated the recording process and allow multiple takes, the multitrack recording had another profound effect on music production  it enabled producers and audio engineers to create new sounds that would be impossible to do in a live performance style ordering. Examples include the psychedelic rock sound effects of the 1960s, e.g. playing back the sound of recorded instruments backward changing the tape to produce unique sound effects. During the same period, the instruments of popular music began to shift from the acoustic instruments of traditional music (piano, upright bass, acoustic guitar, strings, brass and wind instruments) to electric piano, electronic organ, synthesizer, electric bass and electric guitar. These new instruments were electric or electronic, and thus they used instrument amplifiers and speaker enclosures (speaker cabinets) to create sound. Producers like Phil Spector and George Martin were soon creating recordings that were, in practical terms, almost impossible to realize in live performance. Producers became creative figures in the studio. Other examples of such engineers includes Joe Meek, Teo Macero, Brian Wilson, and Biddu. At the end of the 20th century, digital recording and producing tools, then widespread availability of relatively affordable computers with music software made music producing more accessible. While most music production is done using sophisticated software, some musicians and producers prefer the minutiae of older analog technology. Professor Albin Zak claims that the increased automation of both newer processes and newer instruments reduces the level of control and manipulation available to musicians and producers. Production has changed drastically over the years with advancing technology. Where the producer's role has changed, they have always been seen as a jack of all trades, as their duties require a broad knowledge of the recording process. NME identifies some of the greatest producers ever. ↑ Similarly, although The Beatles' productions were credited to George Martin throughout their recording career, many sources now attest that Lennon and McCartney in particular had an increasing influence on the production process as the group's career progressed, and especially after the band retired from touring in 1966. In an extreme example of this, Martin actually went on a two-week vacation as The Beatles were recording The White Album; production of several completed tracks on the album were credited to The Beatles on internal paperwork at Abbey Road Studios, although the released LP gave sole production credit to Martin. ↑ "What does a music producer do, anyway ? – Production Advice". productionadvice.co.uk. Retrieved 2017-01-09. ↑ Weissman, Richard: Understanding the Music Business "." (2016) Retrieved 9 June. 2017. ↑ "Music Production Degree". berklee mag. ↑ "Music production should be offered to students of all disciplines". statepress. ↑ "Game Changer Beats Trap Beats and Type Beats Home Page - Game Changer Beats". Game Changer Beats. Retrieved 2017-07-11. ↑ Kot, Greg (2016-03-10). "What does a record producer do?". BBC. Retrieved 2016-01-09. ↑ "Digital Audio Workstations" (PDF). Center for Computer Research in Music and Acoustics. Stanford University. Retrieved 2016-05-15. ↑ "Which DAW is the Industry Standard?". Agenda Red. Retrieved 2016-05-15. ↑ Joseph, Kiesha (Feb 11, 2016). "AUDIO RECORDING SOFTWARE: AVID PRO TOOLS VS APPLE LOGIC PRO X". F.I.R.S.T. INSTITUTE BLOG. first.edu. Retrieved 2016-05-15. ↑ Zak,Albin J., I.,II. (2002). Reviews: "strange sounds: Music, technology, and culture," by Timothy D. Taylor. Current Musicology, 159-180. ↑ Pras, Amandine, Caroline Cance, and Catherine Guastavino. "Record Producers' Best Practices For Artistic Direction—From Light Coaching To Deeper Collaboration With Musicians." Journal of New Music Research 42.4 (2013): 381-95. Academic Search Premier. Web. 7 Sept. 2015. ↑ Casetti, Chris. "Triple Threats: 13 Female Singers Who Write And Produce Their Own Work". VH1 News. Retrieved 20 September 2018. Lua error in mw.title.lua at line 206: too many expensive function calls. This article "Record producer" is from Wikipedia. The list of its authors can be seen in its historical. Articles copied from Draft Namespace on Wikipedia could be seen on the Draft Namespace of Wikipedia and not main one. This page was last edited on 25 December 2018, at 06:33.